Bloating results from a buildup of gas in your gastrointestinal tract. Likely culprits of bloating include poor eating habits -- such as eating with your mouth open -- a fatty diet, sudden increase in fiber intake, stress or smoking. In some cases, a health problem, such as a gastrointestinal infection or irritable bowel syndrome, may be to blame. Natural remedies such as ginger can treat bloating. However, consult your doctor before taking ginger to banish bloating. Ginger, or Zingiber officinale, is a tropical underground stem, or rhizome, that has been used as food and medicine for thousands of years. It contains several active ingredients, including pungent compounds called gingerols and shogaols. It has long been used in various cultures, such as the Ancient Greeks, to prevent digestive problems. Ginger also helps to relieve conditions that cause bloating, such as menstrual cramps. Herbs that help to soothe the digestive tract and relieve gas are known as carminatives. 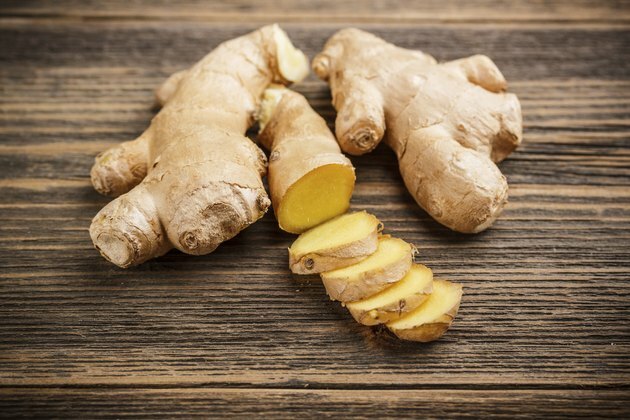 Ginger is a particularly effective carminative, helping to alleviate gas, bloating and cramps, according to James A. Duke, author of "The Green Pharmacy Guide to Healing Foods." This herb calms intestinal activity and expels gas from your digestive tract. Ginger also thins blood and improves circulation, which further helps to relieve bloating. Gingerols in ginger are also effective pain relievers, which makes them useful in fighting the abdominal pain that often accompanies bloating. To treat gas, which can lead to bloating, adults can take 2 to 4 grams of fresh root daily, or 0.25 to 1 grams of powdered root daily, according to the University of Maryland Medical Center. For ginger liquid extract, the recommended dose for adults is 30 to 90 drops or 1.5 to 3.0 milliliters daily. Duke points out that you can add ½ tsp of ground or freshly grated ginger to 1 cup of hot water to make a tea to relieve gas. Because ginger can thin blood, you should not take it if you are on a blood-thinning medication, such as warfarin or aspirin without your doctor's guidance. Also see your doctor if you have gallstones before consuming ginger. In rare cases, ginger may cause mild diarrhea, mild heartburn, mouth irritation or stomach discomfort. Taking ginger capsules may prevent gastrointestinal side effects, notes the University of Maryland Medical Center. The Green Pharmacy Guide to Healing Foods; James A. Duke, Ph.D.
How Much Raw Ginger Can You Eat?